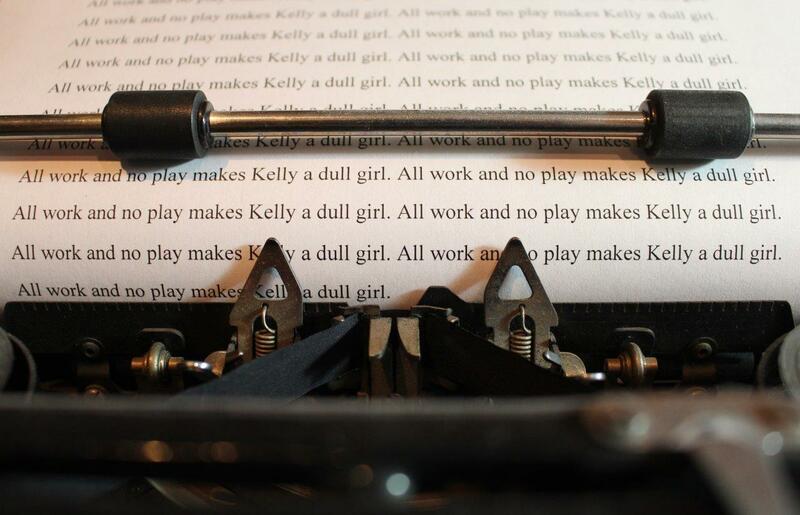 Remember this famous line: “All work and no play makes Jack a dull boy”? Repeated over and over, for pages and pages, that single sentence fills the white spaces of a fictitious, yet infamous, character’s work in progress. After days of producing nothing of substance for the book he’s supposed to be writing, Jack appears demented—or worse, possessed by a sinister ghost. The iconic imagery above is, of course, from The Shining—Steven King’s 1977 bestselling novel later transformed into blockbuster horror film. It’s a dream for many writers to be as prolific and successful as Mr. King. But try as I may, I relate more to poor, ol’ menacing Jack: I could easily isolate myself from society, shore up in a room for days, and drown myself in my writing. I’m equally obsessed as he . . . luckily not possessed, at least not usually. Still, I know Jack’s frustration all too well. Like him, I’m not making significant progress on the two writing projects I’m most passionate about. One of my unfinished books is the biography of a female pastor, Janet Noble-Richardson. My inspiration to write about Janet stems from her influence on my spiritual life. I never met anyone who expressed such abundant Christ-like love in their own behavior. Janet taught love by modeling it, and I admired her faith-filled approach. I want people to see the way Janet lived her life and to understand what it looks like to be in close relationship with Christ. I hope her story will inspire people to develop their own connections to Christ and make Him the priority in their lives. My job to tell Janet’s story is complicated for a variety of reasons. I need to verify facts, but I can’t ask Janet for clarification of personal details. She died in a car accident in 2006. So, I’m piecing the story together through written documents she left and through interviews with people who knew her. Janet’s father told me stories of raising his family in Pakistan, where he and his wife served as missionaries. The family met people from many different nations. American diplomats and foreign ambassadors regularly attended church services at the Noble’s home in Islamabad. Pastor Noble recounted one story with great fondness, and I could appreciate how significant the moment was for him and his family. On a vacation into northern India, they met a boy who said he was studying under the Dalai Lama. Ever since encountering the boy, the family has wondered whether he grew up to become the current Dalai Lama. I started researching Janet’s story over two years ago and quickly realized that in representing facts accurately I would have to expose hard truths like this: It’s improbable that the boy the family met in India in 1961 could be the same man who is the current Dalai Lama. My investigation indicates that His Holiness, the 14th Dalai Lama, had been living in Dharamsala at the time the Nobles were visiting the area. As I write this article in 2017, however, the 14th Dalai Lama is still alive. Before the next can be chosen, His Holiness must die and reincarnate. Therefore, the 15th Dalai Lama has yet to be born, if at all. That means that the boy the Nobles met may have been a student of some sort, but he couldn’t have been training to be the Tibetan religious leader. You can see why Janet’s biography is complicated. I hate thinking that I could ruin another really good family story. Regardless, I’m committed to doing my best, even if it takes me a decade to get the book done. The other book I’m writing is for children. The story is flowery and fanciful—a work of fiction in which flora and fauna talk to one another. It has villains and heroes, conflict, resolution, symbolism, and a heart-warming ending. It is the kind of book that binds grandparents to their grandkids. The elders will want to read it aloud and the youth will cherish the book as their favorite. I know the premise and I’m developing the cast of characters. One is named Grace—not for a didactic religious purpose, but because I promised my best friend during middle school that one day, I would name one of my children after her, Marjorie Grace. You may all be thinking: finish one book before you start another. But writers don’t think like that. We can’t stop the ideas that come flooding our way. We do our best to harness them. Sometimes we’re desperate and reach for scraps of paper and napkins to scribble upon. Other times, we trap our story arcs in fancy journals until it’s time to unravel our thoughts and spin them into order with the help of software like Microsoft Word and Scrivener. When friends like you ask how my books are coming, I know I overuse the words, “I wish I had more time to write,” and it feels like a horribly weak excuse. But I don’t worry about the time it takes. I know that I’m a work in progress too. While I’m forever thinking, composing, revising, and promoting, God is taking His time refining me—shaping my life through the people and experiences that are unique to me. I’m growing in knowledge and developing new skills. I’m learning to be a better person by juggling the demands of everyday life, experiencing burdens and joys, dealing with complex issues and personalities. When oppressive thoughts lure me into thinking that it would be quicker and easier to check out from society—like Jack did—to mine my treasures, I know better. Fairy tale endings aren’t discovered in privacy and seclusion. Life among the living is rich with inspiration. I’m savoring my time in the real world with family and friends. I’m at peace knowing that I’ll finish what I need to when the time is perfectly right. Kelly, I enjoyed reading your blog. Good luck with your writing. I’m also working on more than one project at a time because the ideas keep coming. I need to research Schrivener to help me organize my stories better. Wishing you continued productivity, Barbara. Scrivener offers a free trial period and a tutorial to walk you through the software. The trial period lasts for thirty days of use and is an ideal way to see if the program is something that you’d like to purchase.